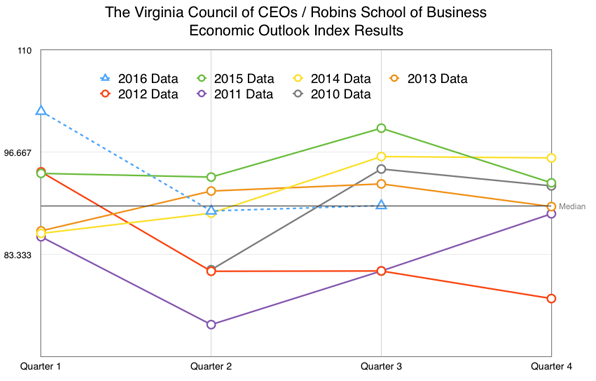 The third quarter 2016 CEO Economic Outlook survey finds that chief executives in central Virginia continue to have concerns over the upcoming election and sluggish economy. The survey’s index, which measures executives’ views on projected hiring, capital spending and sales over the next six months, remained essentially unchanged from the level recorded last quarter, which is close to its long-run average. The survey has been administered quarterly since 2010. Read Robins School of Business press release. 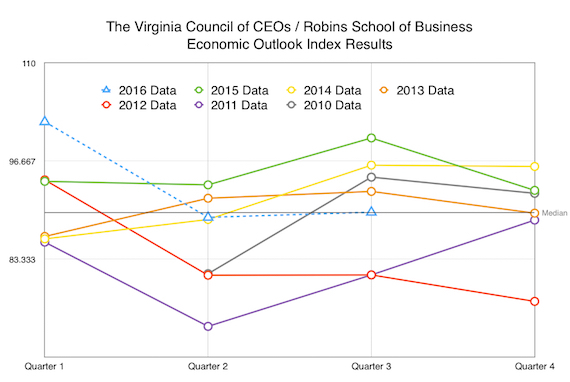 This quarter’s survey asked specifically about the election and the impact of Brexit on central Virginia companies. No executives expect Brexit to have an impact on their business, either positive or negative. However, 74% of CEOs believe that Hillary Clinton will win the US presidential election and, while 52 percent believe her election will have no appreciable impact on their company’s profits, nearly 30 percent believe that it will decrease future profits. The survey, adapted from a similar Business Roundtable national survey, provides a snap shot of the overall economic outlook index for various companies within the region. It also helps central Virginia companies anticipate business decisions and plan for growth. Randy Raggio, Associate Dean at the Robins School of Business, administers the survey and collects the responses each quarter. Read Richmond Times Dispatch coverage. The Council continues to expand the survey beyond its members, offering any area business owners whose companies gross at least $1 million in annual revenue the opportunity to participate. If enough businesses participate, the council will provide survey results by industry. Participation is free, and all participants will receive copies of the survey data. 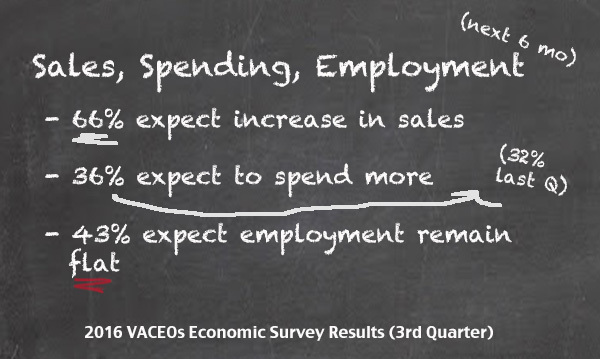 Business owners and CEOs who would like to participate in the next survey should contact Scot McRoberts at smcroberts@vaceos.org.